Scientists at Texas A&M have found that citrulline, an ingredient in watermelon, can trigger production of a compound that helps relax blood vessels in the body – which is effectively what Viagra does. Found in the flesh and rind of watermelons, citrulline reacts with the body’s enzymes when consumed and is changed into arginine, an amino acid that benefits the heart, and the circulatory and immune systems. Urban gardens are sprouting up (zing!) in many cities all over the world, since food prices are on the rise, and, well, it’s just a damn good idea. 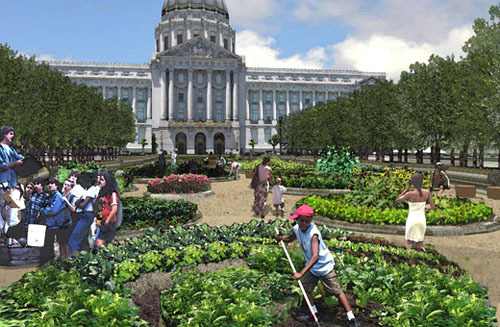 Yesterday in San Francisco, Slow Food Nation began working on a large victory garden in front of City Hall. This garden is being planted on the same site as the post-World War II gardens 60 years ago, when the nation’s food supplies were low and the economy was in rough shape. At the time, victory gardens across the country – planted on both public and private land – supplied 40 percent of the food surplus. Food grown in the Slow Food Nation Victory Garden in San Francisco will be donated to food banks and people in need. Libertarians have long warned that interventionism in foreign affairs inexorably leads to interventionism in domestic policy.